Medfield Animal Shelter News: It’s Time for the Matching Challenge Fundraiser! It’s Time for the Matching Challenge Fundraiser! Our annual matching challenge fundraiser is back and is better than ever! A small group of kind and generous donors have offered to match all donations made between November 15, 2015 and January 15, 2016 — up to $25,000. Previous matching challenge fundraisers have helped us raise a significant portion of our operating budget for the year, allowing our volunteers to spend more time helping pets in need and less time raising money. 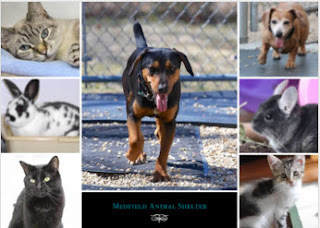 The Matching Challenge Grant is open to anyone wishing to support the Medfield Animal Shelter, and donations can be made by mailing a check or you can use your credit card by clicking the Donate button on MedfieldShelter.com, so please spread the word and make a donation today! Looking for a last minute gift for an animal lover? If you make a donation in that person’s honor we will send a photo card acknowledging your gift.